Of all the behaviors animals engage in, play is the least controversial in its suggestion of feelings of pleasure. Animal play has an unmistakable quality. The whole comportment of the participants exudes joie de vivre. Playing has an important role in survival. When animals and humans play games such as chasing, wrestling, or tug-of-war, they gain or maintain physical strength and learn important survival skills or proper social behavior. This is probably why play is more prevalent in younger animals: they are growing and have more to learn. But although it is important, play is not indispensable to survival. It occurs only when needs such as food, shelter, and safety are sufficiently met and when unpleasant feelings like pain, fear, and anxiety are minimal or absent. A variety of wild and captive studies confirm that animal play is suppressed in times of hardship, such as those marked by food shortages, harsh climatic conditions, social upheaval, and stress. Thus, play is a good indicator of an animal's well-being. For many of us, the most familiar animal play is that of domesticated dogs and cats. My two cats play-stalk, -chase, and -wrestle each other. They also enjoy sporting with laser pointers, Cat Dancers, and pull toys, especially when I drag the toys beneath a rug. As unique individuals, they show idiosyncrasies in their play preferences. Megan enjoys chasing a ball of aluminum foil (preferably after I've thrown it), batting it with her front paws. If I spread newspapers out on the floor, it usually isn't long before Megan is crawling under them, and by day's end they are often crumpled and torn. Mica favors hanging upside down from the edge of an armchair, holding himself in place with his hind feet braced against an armrest, while I drag and toss a string toy within his reach. Play isn't just for animals who eat from a bowl. Most mammals and many birds (to date, from thirteen of the twenty-seven bird orders) are known to play, and there are anecdotal accounts of playlike behavior in some reptiles and fishes. Play has been recorded in every species of primate studied. On a recent visit to South Africa, I joined a "baboon walk" with the managers of Baboon Matters, a nonprofit group set up to protect the wild baboons and resolve conflicts with human residents in the Cape Town area. The rambunctious play of a group of youngsters on a grassy hillside at the end of a residential street was a joyous sight. They would scamper up the ten-meter-high slope, then leap, roll, tussle, or summersault their way down again. Flying ambushes, play bites, and limb-tuggings were part of a stream of play that went on for at least ten minutes. I could hear the thuds of their little bodies hitting the ground as they hurtled down the hill, twisting and rolling in a grappling heap of as many as four individuals. You can watch one of the sequences I filmed in a video titled "romping baboons" on YouTube; the resolution is poor, but you'll get the idea. In the early 1980s a team of scientists in Israel spent 950 hours observing eleven groups of Arabian babblers. Babblers are songbirds similar in shape and size to the American robin or the European blackbird. They live in tightly knit family groups of half a dozen or so individuals. The researchers documented 2,500 instances of play among their subjects, including four hours recorded on videotape for analysis. The most common forms of play observed were wrestling, displacement (king of the hill), chases, and tug-of-war. I've seen a segment of the tape, and let me tell you: small birds wrestling on the ground like kittens make for an arresting sight. The babblers also use several types of play signals, including first establishing eye contact and then crouching, rolling over, grabbing a stick and holding it aloft, and making a play bow. I was unable to obtain a good-quality photograph of Arabian babblers playing for this book, but you can see jungle babblers allofeeding on page 000 [2.7-2.9] and allopreening on page 000 [3.9-3.10]. Because life in the wild is so often ungenerously viewed as an endless struggle for survival, we may not think that undomesticated creatures play. A correspondent to New Scientist described seeing two magpies repeatedly take turns pecking the tip of a fox's tail before hopping off. The fox merely flicked her tail each time, perhaps out of irritation. There are many other accounts of magpies, ravens, and crows doing this sort of thing (see page 000 [1.6]). It's usually put in an earnest, adaptive context, and indeed another reader suggested that the magpies in her garden harassed her two cats to prevent them from approaching the tree where the birds nest. But I find this explanation unsatisfying. For one thing, it isn't clear that attracting the cats' attention like this would deter them from going after the nest. For another, the second reader also reported seeing the behavior in the autumn and winter, when the nest would be empty. Such behavior could be just plain fun or exciting for the harassers-a mischievous game made more thrilling by the element of risk involved. Let me hasten to add that these evolutionary and experiential sorts of explanations are not mutually exclusive. One, in fact, is the genesis of the other. The cow was leaping in the air and cavorting around like a puppy playing. I pulled my bike over to watch. When I looked closer, I saw that she was playing with a fox! The fox was dancing around in front of her, play-bowing and then bounding away. The cow would give a playful chase and then stop, waiting for the fox to initiate again. I watched for several minutes before both animals went back to "normal" behavior. Foxes also engage in solitary play. I recently watched one trotting across a field rimed with frost. She flopped onto her side and propelled herself along the slippery grass a few feet before getting up again. Not surprisingly, I've included an image of playing foxes (kits, in this case) in this book (see page 000 [1.3]). They play tug-of-war and keep-away with large branches and small saplings, often teaming up to defeat another. They will sneak up on a buddy who is snoozing in a mud hole and splash water on him and then run like hell. ... On a warm spring day the younger ones will run across the pasture, jump and spin around in midair just for the pure joy of it. Some games-such as play-fighting among predators-could cause injury. This may be one reason why animals use specific signals to invite others to play. The dog's familiar play bow, for instance, is a canid's way of communicating something to the effect of: "Okay, while I might be about to clamp my jaws down on your foreleg, it'll just be playful, and I'll restrain myself from biting too hard." The play bow is recognized by animals other than dogs. There are several accounts of domesticated huskies playing with wild polar bears. One celebrated case lasted several days and was featured in National Geographic. Different species use a variety of play signals, including a head wobble, a stiff-legged jump, a roll on the ground, a tail whip, a hunched back, and a kicking leap in the air. Not all play invitations are visual; the ultrasonic chirps of mirthful rats are believed to signal readiness for positive social engagement. They are an acoustic version of a dog's play bow. Animals play fair. Detailed analyses of wrestling rats and boxing wallabies show that larger, stronger individuals actually temper the boisterousness of their actions. This strategy not only averts injury (useful for the husky who plays with the bear!) but sustains the game. Animals who play too roughly may have trouble finding a playmate and risk being shunned by others. Chimpanzees who roughhouse in pairs have been shown to increase their play signaling in proximity to adults, particularly as the intensity of play bouts increases. This is thought to minimize the possibility that the mother of the younger chimp will intervene and spoil the fun. All told, the evolution of play involves sophisticated communication, self-control, and fairness-to the other and to oneself. Some animals show their desire to be treated fairly by demonstrating what scientists have termed inequity aversion. A pair of captive brown capuchin monkeys are content to exchange a token for a slice of cucumber, but if one of them begins to get rewarded with preferred grapes, the other refuses to accept cucumbers. Another recent study from the University of Vienna demonstrates a sense of fairness in dogs. Dogs who are not given a treat when they respond to a simple command (shaking a paw with the experimenter) will eventually refuse to respond to the command if a dog next to them is rewarded for the same behavior. If, however, the denied dog is unaccompanied, she or he will perform the task for much longer, indicating that the earlier refusal was not merely due to frustration or fatigue. From fairness it's not a huge leap to justice. Play has rules of conduct, encourages restraint, involves give-and-take, and fosters awareness of another's point of view. For all these reasons, some scientists now think that the roots of morality lie in animal play. Although sharing, for example, was until quite recently thought to be a solely human trait, more and more examples of animals showing fairness and consideration for others are coming to light. Dolphins, elephants, rats, and bats will come to the aid of another who is distressed, wounded, or disabled. When caged capuchin monkeys have to cooperate in dragging a heavy tray so they can get the food on it, they quickly figure out how to do so, then share the effort and the food. If food is placed on one side of the tray so that only one monkey has access to it, they still share, even though that monkey could have it all to him- or herself. Naked mole rats readily share their food with colonymates, and jackdaws are more likely to share favorite foods than less-preferred foods with other jackdaws. For all of its carefree nature, play turns out to have significant implications for being nice and for doing what's right. This shouldn't be too surprising. Living in social groups requires getting along, and play is one of nature's most effective social lubricants. 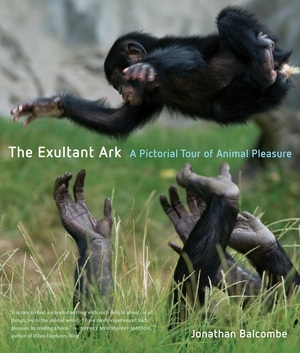 Jonathan Balcombe, author of The Exultant Ark, talks about his book in this Q & A interview.